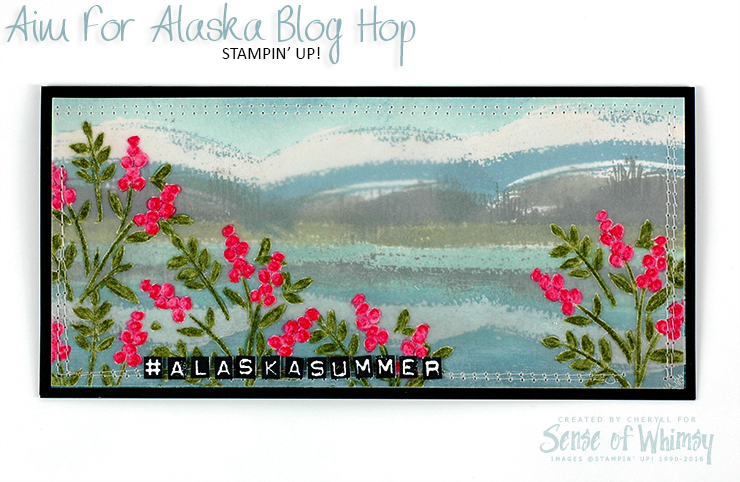 Thank you for joining the Aim for Alaska Blog Hop! You may be starting here or have come from one of the other Blog Hop participants. Either way, I hope you are enjoying hopping around and checking out all the projects inspired by “Alaska”. Why Alaska you may ask? The Stampin’ Up! incentive trip for 2018 is a cruise around Alaska. It would be a dream come true to be able to join this trip, however getting there is a lot of hard work. So for the last six months, I have been a part of Kylie Bertucci’s training group “Aim for Alaska” to give me the best chance of getting on the ship. It has been an inspiring and amazing experience, whether I actually make the cruise or not. Not only does Kylie share her steps to success, she has organised top demonstrators from around the world to share their tips on being successful in live presentations on facebook. The group provides an invaluable support network, encouragement and a sense of “community”. 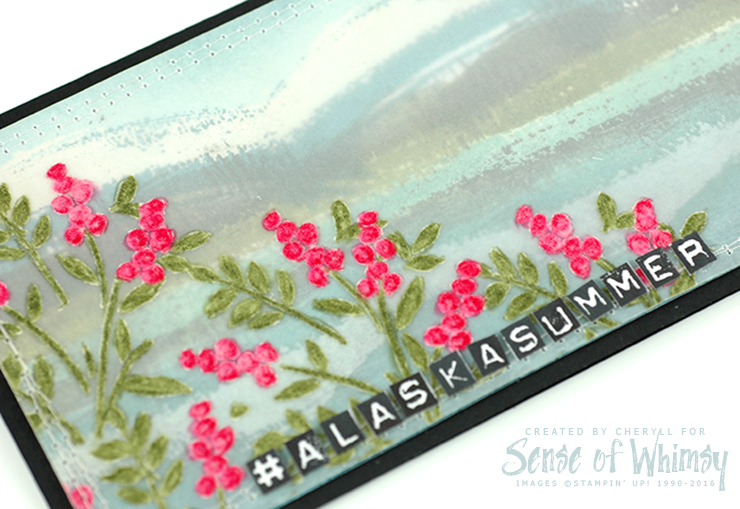 The theme of the blog hop is ‘Inspired by Alaska” … and we had total free rein in choosing what inspired us about Alaska. When it came time to create my project, I browsed Instagram for images relating to Alaska in the summertime to get some creative mojo happening. I saw big snow capped mountains and green forests reflected in calm deep blue water, big skies and pretty wildflowers. There are a number of Stampin’ Up! stamp sets which would have suited, however I don’t have any of them. So I decided to try and create a landscape with texture stamps! I decided on a DL sized card to give me scope to create the impression of “big” mountains in the distance, and I knew I had to have my wild flowers in the foreground. I realised my “texture stamp” scene would be quite impressionist, so I elected to layer vellum over the scene to soften it and this also allowed me to bring my wild flowers into the foreground and frame the image. And for once, an idea happened pretty much to plan! The flowers are from the Number of Years stamp set and they are a two step stamp. I white embossed them onto a DL sized piece of vellum. Then I flipped the piece over and worked on the reverse side with the Stampin’ Up! Watercolour Pencils, using the white embossing as a guide for where to colour. This side with the Watercolour pencil now becomes the front and the white embossing is on the reverse side. I blended the pencil a little bit with a blender pen and tried to ensure there was minimal white showing around the edges. The blender pen lifted some colour, with the white embossing behind making some areas appear lighter and giving the flowers some texture and shading. The watercolour pencils adhere to the vellum really well, with no smearing. (Don’t use water to blend the pencils on vellum … the vellum reacts to water and totally warps). I did take a photo of the scene before I secured the vellum …. here it is! You can see why it needed to be softened! It looks a little bit like a swamp here, but once it is softened and framed, the landscape suddenly appears. The texture stamps used for the background are from Work of Art and Sheltering Tree stamp sets. Some areas have been white embossed and some clear embossed so I could work different colours over the top. The upright “trees” are created with the tiny grass image from Sheltering Tree set. The texture in the water is created with one of the stamps from Timeless Textures stamp set. 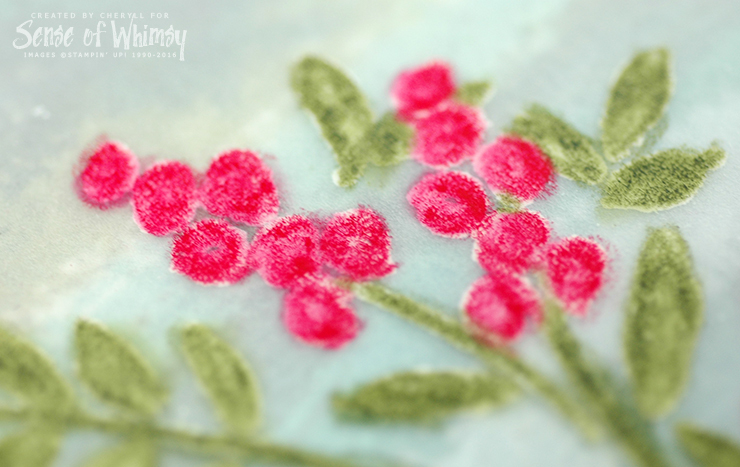 To attach the vellum, I first applied some Mini Glue Dots behind some of the flowers, then I added some stitching to secure it around the edges. I did leave a couple of gaps in the stitching as I have found that vellum buckles with changes in the weather, so leaving some gaps will hopefully allow air to escape and alleviate the buckling. Make sure you continue “hopping” around and visit all the blogs in the hop! I hope the projects inspire you to also “Aim for Alaska”. If you would like to find out more about joining Stampin’ Up! and be part of my Inks and Whimsy Stampin’ Up! team, give me a yell via email or phone 0438 464451. Or click on the “Join” image to head on over to the sign up page. You too could be working towards a great incentive trip with Stampin’ Up! If you would like to try the Watercolour Pencils on Vellum technique, here are the products you will need to do that. If you are purchasing in my online shop, don’t forget to use the March Host code to share in the rewards at the end of the month. wow, amazing. I like the colors and design of this card. OMG….this is such clever work Cheryll. This is such a clever background. Totally love it. My jaw is on the floor, Cheryll! Absolutely brilliant! Beautiful flowers! I love this technique and thank you for explaining how you made it. Your stitching is “sew” cute! Good luck earning your Alaska trip! Thank you Kris! Stitching 🙂 I had to do two rows because the first one was wonky … and the letters have been cleverly placed to hide a total “whoops” .. I have a love/hate relationship with my sewing machine! Awesome! Great job of creating your scene! TOTALLY NAILED IT!! Just beautiful! WOW Cheryl 🙂 This is gorgeous! Wow!! Oh my Cheryll – this is a work of art. Amazing. So much detail and different techniques you have used. Just wonderful. Thanks for being part of my Aim for Alaska Training! That is an amazing picture/card. You out do yourself every time. I LOVE your tutorial. what a brilliant idea! thank you for sharing!